This is one of the most beautiful places in the Philippines that you should not forget to visit. The place can be reached by Airplane, for about 45 minutes. The destination is from Manila – Busuanga. You can book your flight from one of the following airlines Philippine Airlines, Air Philippines, Zest Air and Cebu Pacific. At Busuanga airport, you need to ride a Van going to Coron Town. 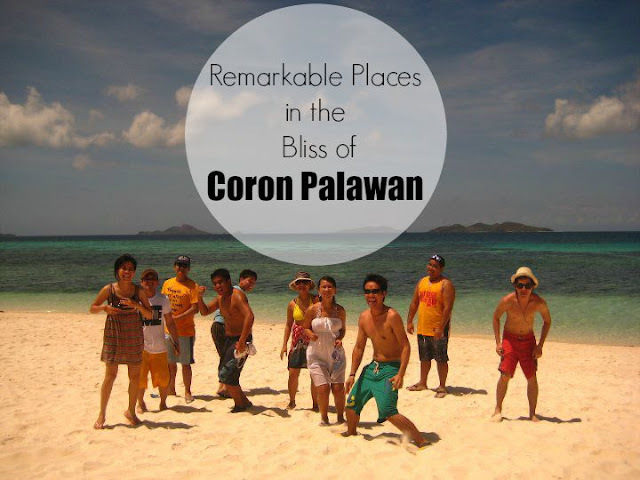 We stayed at Coron Reef Pension House for 3 nights and 4 days (very simple). The place can accommodate 8 persons per room. You can contact Tata at 09095814463 for the tour package details. But they're a lot of tour packages you can get when you are already in Coron Town, that I think, is much cheaper. But we have decided to get the service of Tata so that we are all set and hassle free at the time we arrive in the place. For the food, they're a lot of restaurants that you can choose from in Coron. Please check below information for our Itinerary. better to use Underwater Camera. thanks for organizing this trip ace...great job!!! when will be our next travel with the group! a place that you can relax while enjoying the beautiful view of all the islands. yes, you should visit Coron and promise you will enjoy it and you will amazed to the place. I've never seen a giraffe and zebra that close, and that island with white sand is amazing! Hey, this is so nice. The last time I was in Coron was some 12 years ago or so, back when I was an active scuba diving instructor. Thanks for the photos.